For nearly a decade, a middle-aged woman in Virginia (her own words) had much of the science fiction community in thrall. Her short stories were awarded, lauded and extremely well-reviewed. They were also regarded as “ineluctably masculine,” because Alice Sheldon was writing as James Tiptree Jr. In celebration of Alice Sheldon’s centenary, Letters to Tiptree presents a selection of thoughtful letters from thirty-nine science fiction and fantasy writers, editors, critics, and fans address questions of gender, of sexuality, of the impossibility and joy of knowing someone only through their fiction and biography. When Twelfth Planet Press sent me a review copy of Letters to Tiptree, I admit I was a little apprehensive. I’ve not read any of the stories Alice Sheldon published under the names of James Tiptree Jr. and Raccoona Sheldon. I’m not even especially interested in science fiction spanning the late 60s and 70s–though I have felt some pressure to become familiar with this era of canon, much as Renay has commented. So I was a little bit surprised by just how much I enjoyed this book. 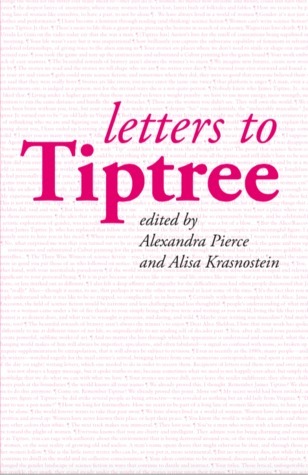 Letters to Tiptree is divided into several sections. The first and largest consists of letters written for this collection by authors, academics and fans to Alice, Tiptree and/or Raccoona. There is an impressive diversity of voices here, containing writers of varying backgrounds, nationalities, races, generations, gender identities, sexualities and classes. This diversity serves to showcase the wide impact Tiptree’s work had–and continues to have–upon the speculative fiction community. But letter writing–even when the letters remain unanswered–is a two-way street. I found myself equally as fascinated by what the letters revealed about their writers as what they said about Tiptree. Some clearly had an eye towards their third-party audience, while others were more focussed on the person they were writing to. Some letters were restless and unhappy, while others were breathtaking in their sincere gratitude. Even the anger present in some merely added to the sense that this collection was a beautiful love letter. Gender and identity are naturally one of the major preoccupations of these letters. It was interesting to see the different conclusions authors came to while pondering what ground–if any–feminism has gained since Tiptree’s death thirty years ago. However, this wasn’t the sole focus of these letters. They also dwelt on some of the other overarching themes of Tiptree’s work, such as class, colonialism, technology and time. The second section is formed of a selection of letters exchanged between Alice Sheldon and her contemporaries–specifically Ursula LeGuin and Joanna Russ. Sheldon had been writing to these two women under the guise of Tiptree and had formed close friendships with them. When the death of Sheldon’s mother began to unravel the identity of James Tiptree Jr., she was quick to write to them and confess the truth. The letters included in this book centre around these confessions. After hearing so much about the influence of Tiptree on the writers of the first section, it was a delight to hear her speak in her own voice. At the same time, it was heartbreaking because her fear and unhappiness are very evident. This is followed by a section with a more academic focus, containing a few anthology introductions and excerpts from more scholarly works. I’d been able to grasp much of the context of Tiptree’s work from the letters in the first section, though this did a good job of filling in some of the gaps and expanding the territory a little bit. I found Wendy Guy Pearson’s 1999 paper on Tiptree as a transgender writer to be particularly interesting. The collection was rounded out with letters from the two editors addressed to Tiptree and reflecting on their experiences of putting the collection together. I liked the way this brought things back to the personal, completing the cycle. If the aim of the book was to interest new readers in the life and work of Tiptree, it succeeded in my case.